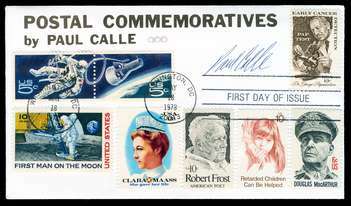 1754 [1978 13c Dr. George Papanicolaou, PAP Test] FDC of the PAP Test stamp with cachet "Postal Commemoratives by Paul Calle" in combination with other Paul Calle stamps: 5c Space Twins pair, 10c Moon Landing, 13c Clara Maass, 10c Robert Frost, 10c Retarted [sic] Children, and 6c Douglas MacArthur -- all tied by the same cancels. AUTOGRAPHED BY THE STAMP ARTIST, Paul Calle. This must have been prepared in some quantity, but with a few minutes of searching, I have only been able to find one other example offered in the last few months (and the selling price was not stated). Other Paul Calle signed philatelic items seem to range from $15 to $75.